CARMEL, Calif. – Aug. 17, 2016 – One of this year’s Automotive Fine Arts Society (AFAS) guest artists, Sandrine Blondel will display several paintings celebrating internal combustion engines during the 2016 Pebble Beach Concours d’Elegance® on Sunday, Aug. 21, from 9:00 a.m. to 4:30 p.m. Applying acrylic to aluminum, Blondel uses bright colors and bold shapes to bring power plants to life. Sponsored by The Lincoln Motor Company, the 2016 AFAS exhibit at the 18th fairway of Pebble Beach Golf Links in beautiful Pebble Beach, California, will showcase the latest creations from the world’s finest automotive artists. 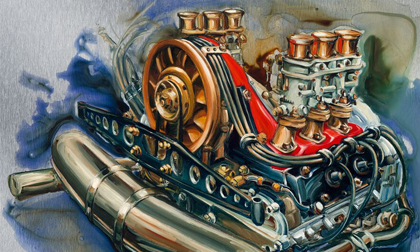 Two pieces featuring the engines of Porsches are approximately 30” x 30” in acrylic on aluminum. The painting with a 1975 Porsche 911 Turbo entitled “911 II” features the engine of the piece’s title and explores the unique details under the hood. The vivid blues conveys a peaceful side to the high-performance beast, while the bright red and copper of the six-cylinder boxer engine showcased in “Porsche 911 Turbo” illustrates its high performance intentions. A Rolls Royce and Jaguar are the subjects of two approximately 40” x 40” acrylics on aluminum. “Rolls Royce Silver Ghost” features a beautiful pre-war engine with the same sleek lines and sophistication as the car it powers. The high-class V8 engine revving up “Jaguar XK” delivers the same energy that is expected from the English powerhouse. Blondel’s artwork brings the engines to life in vibrant colors against metallic backgrounds. Sandrine Blondel was born in Paris. From the age of 10, she spent 3 months of the year outside of the city in the deserts of Africa, where her mother drove Land Rovers as a tour guide in the desert. Thousands of miles on trails with her mother sparked a fascination for motors and machines. In 1987, Sandrine graduated from ESAG Penninghen in the Graphic Arts section. She then moved to the Ivory Coast to work as an Artistic Manager at an advertising agency. After a few years, she returned to France to work as a freelance artistic director and painter. Since 2000, Sandrine has devoted herself solely to painting in her Saint-Denis studio in the south of France. Sandrine started working on raw linen canvas in reference to a three-color process inspired by the Bernd and Hills Becher retrospective in Beaubourg. She then chose to treat this theme on wide plates of steel structured by rust, and more recently on aluminum. Painting on metal requires a special technique which releases energy and vibration and relies on instinct. By choosing a metallic structure covered with resin, Sandrine expresses a powerful materialization of the theme with a complete osmosis between the structure and the subject. She has shown her work in exhibits across Europe and the U.S.
To learn more about Sandrine Blondel and to see her work, visit her website: www.sandrineblondel.com. AFAS was established in 1983 by a group of artists who are acknowledged by critics to be among the best in their field. Members work in many diverse mediums including oil, watercolors, acrylics, wood, gouache, pen & ink, clay and metal. AFAS and its members participate in select shows across the country including the Pebble Beach Concours d´Elegance, Dana Point Concours d’Elegance and the Amelia Island Concours d´Elegance. Information about AFAS is available at www.autoartgallery.com or by contacting Tyler Weiland at 214.520.3430 x302.